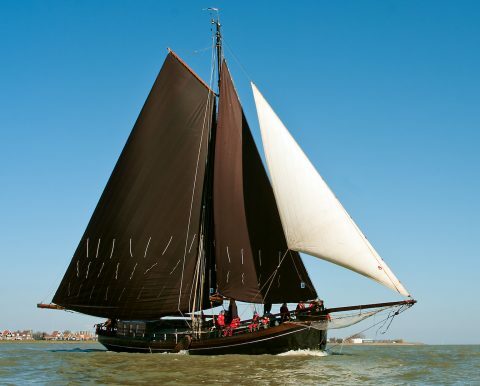 The Willem Jacob is a special clipper, built in 1889. On deck this ship is built for active sailing. Below deck, you’ll find a comfortable and light accommodation with a fire stove and couches. Over the past years the entire ship has been restored. The Willem Jacob still has its beautiful wooden hatch cover, stemming from the period when she was sailing cargo. The hatches are made of pretty, weathered, grey wood. You can sit, walk and sunbathe on them. There is plenty of space. On the aftdeck you’ll find comfortable benches on which you can quietly and safely enjoy the deck activities. This is the place where the captain is steering the wheel. He can tell you all about the ship and what’s happening around it. The structure on top of the ship – the ‘roef’- got it’s former wooden sides back, making her look like she looked originally. Furthermore, the mast and all other spars are made of wood.